Twenty years after the Stockholm live broadcast from the Tunnel of Love tour, Springsteen has another Independence Day offering for his fans, coming to us live once again from Sweden this Friday. On the Fourth of July, as Bruce and the E Street Band play their next stop in Goteborg, SIRIUS Satellite Radio will be broadcasting a portion of the show on E Street Radio (channel 10). Unlike the July 3, 1988 terrestrial radio event, this won't be the entire set; Dave Marsh will host "the special broadcast of a live July 4th-themed show," according to today's press release, "and will segue into the concert in Sweden to bring listeners selected live songs." The program begins at 1 p.m. Eastern. SIRIUS recently extended the run of E Street Radio through mid-2009. Happy Birthday to Nils, who turns 57 today, born June 21, 1951. MORE SUMMERTIME BRUCE FOR THE U.S. The whole month of August, between the 8/2 Foxboro show and the 8/30 Milwaukee show, has been wide open for a while. As of today, we're looking at an additional 7 tour stops that month. Along with the Hershey and Nashville shows previously reported, Bruce and the band are now scheduled to hit arenas in Jacksonville, Charleston, Richmond, St. Louis, and Kansas City. Ticket alert: The Hershey show goes on sale tomorrow morning, Saturday, June 21, at 10 a.m.; the rest go on sale next week. See our Tour/Ticket Info page for full onsale info and links. We've got another August U.S. date: just announced, Bruce and the E Streeters will be playing Nashville on Thursday, August 21. And good news for those of us who aren't crazy about gargantuan stadium shows: they're moving back inside for this one (and likely for other August shows yet to be announced), playing the Sommet Center, formerly Nashville Arena, which seats 18,500. Tickets go on sale a week from tomorrow, June 28, at 10 a.m. Central. See our Tour/Ticket Info page for the full current itinerary, more details and links. At today's televised memorial service for Tim Russert, Luke's "Uncle Tony" (Russert's brother-in-law) performed a beautiful acoustic "Born to Run" in tribute. How do you follow that? Well, Luke and Tom Brokaw had "a little surprise," which Brokaw introduced: "This was the one guest that Tim was never able to persuade to appear on Meet the Press," he said. "But they were great friends, and Tim went wherever he had to to hear him. Ladies and gentlemen, from Europe where he is on tour: The Boss." 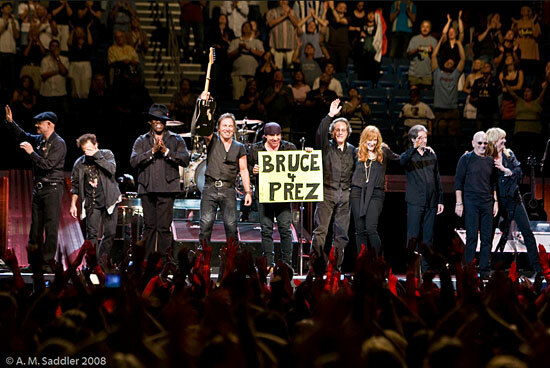 "Luke, Maureen, Big Russ, and the Russert family: we send all our love and prayers from the E Street Band," Bruce said. "We were always flattered and honored to have Tim as part of our E Street Band community. I think Tim had a real belief in that Promised Land, and in the American idea. That was the passion that you heard behind all those tough questions on Sunday morning." 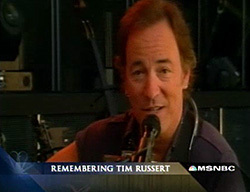 Springsteen shared a memory from the September 2007 Today show appearance, and his thoughts on Russert's legacy, before performing an acoustic "Thunder Road." Watch it at msnbc.com. In between Boston and Milwaukee, Bruce and the E Street Band have added a date at Hersheypark Stadium -- a scaled-down stadium which holds 30,000 -- on August 19. Boardwalk rides, the smell of chocolate, and the sounds of Springsteen... does it get any better? Tickets go on sale this Saturday, June 21, at 10 a.m. Eastern. 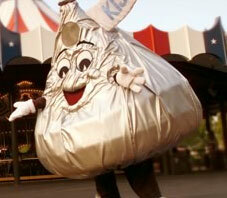 Visit hersheypa.com for more details, and see our Tour/Ticket Info page for the full current itinerary. A question we get pretty often is, "I'm making my first trip to the Jersey Shore... where should I go and what should I see?" Thanks to Stan Goldstein and Jean Mikle's book, Rock & Roll Tour of the Jersey Shore, we've got an easy answer. The first and second editions of their book have been out of print for a while, but now -- just in time for summer vacations and Bruce's Giants Stadium shows -- a Third Edition has just been published. Expanded once again to 202 pages, with updated information and many more photos, this guide to the musical sites on the Jersey Shore is a perfect travel companion for anyone making that pilgrimage. 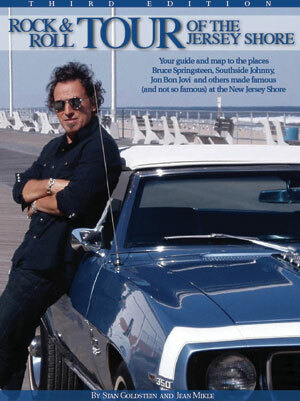 The book details close to 200 locations of historical rock 'n' roll sites in New Jersey's Monmouth, Ocean and Middlesex counties -- including Springsteen-related clubs, houses, street corners and other landmarks in Asbury Park, Freehold, Long Branch, Red Bank and beyond. More than 40 locations are listed for Asbury Park and 30 for Freehold, all well-annotated with maps, addresses and loads of history. Hot off the presses, it's in stock now at Backstreet Records. You'll find lots more new stuff in our online shop now, too. By popular demand, we're expanding our selection of kids' shirts, with new Born in the U.S.A. tees in youth sizes. Plus new Springsteen books, import CDs, and more! Click here for our Latest Additions. And thanks for shopping with us -- your order helps support everything we do. "I'm very intrigued by him," Russert said. "He has a real understanding of the political dialogue, of faith and life in urban America." Russert already has a connection to "the Boss." "I booked concerts for John Carroll [University] in Cleveland," Russert recalled. "We paid $2,500 to book him on a Tuesday night in February 1974." Aside from the indelible mental snapshot of seeing a brilliant performer 18 months before he made it big, Russert cherishes the memory for a more practical reason: "I made enough money to pay for my second year of law school." I asked Russert if he had reached out to Springsteen to request an interview. He shook his head, as if he was unworthy of the meeting. It was reassuring to see that even Tim "No Surrender" Russert, the scourge of Washington, could act a little overwhelmed by someone. 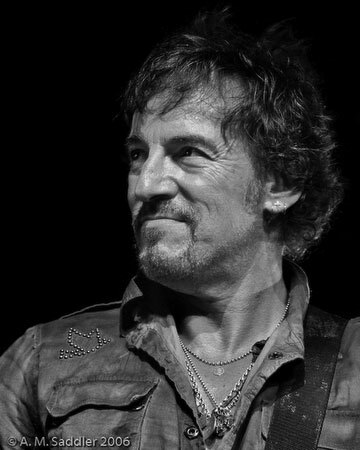 Also check out this New York Times blog entry about Bruce's September 2007 Today show performance, when Russert remarked, "I'm just an opening act for the Boss today," and Bruce gave a shout-out to the newsman's haircut. Russert was married to Maureen Orth, author of the famous 1975 Newsweek cover story on Springsteen, "Making of a Rock Star." Our sympathies are with her and their familiy. Yesterday, Tom Brokaw called Russert "one of the premiere political analyists and journalists of his time." Walter Cronkite wrote: "a giant in our field -- a standard-bearer of journalistic integrity and ethics." Carl Bernstein: "Tim Russert was a transformative journalist." And yet -- maybe just from knowing how "Born to Run" got his heart pumping, too -- he also felt like one of us. Tim, you'll be missed. On August 29, The Creators of S.O.A.P. 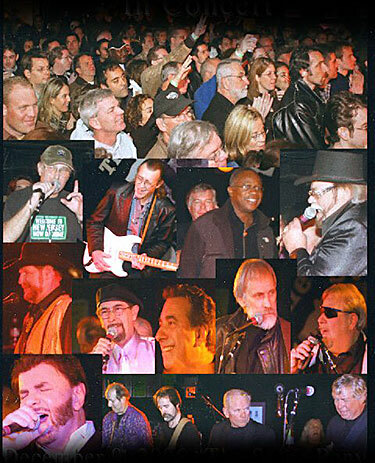 will return to Asbury Park once again to perform and support two local charities based in Asbury Park (The Mercy Center & Interfaith Neighbors) with a concert called: The Ultimate Jersey Shore JAM!!!! The Creators of S.O.A.P. , Live, Raw, and Unplugged In Concert. This time around they bring with them Vini "Mad Dog" Lopez & Steel Mill introducing their new album for the first time, All Man Their Guns for America. 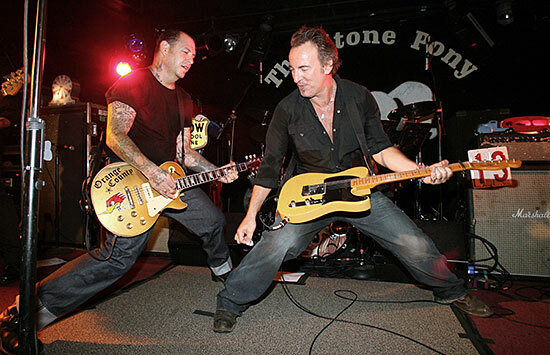 Plus a historic reunion event: for the first time together in 40 years on the same stage, the band that set the tone for the new direction of the Sound of Asbury Park, all the original members of The Moment of Truth: Vini "Mad Dog" Lopez, Garry "The Thunder of the E Street Band" Tallent, Rick DeSarno, and Tom Wuorio. The Creators will also be introducing a hot new band from Virginia Beach, called Wava. Although the band members are only 16 to 18 years old, they have received worldwide acclaim for their self-titled first album release and have managed to incorporate the Sound Of Asbury Park into their music and once again re-invent that classic rock & roll sound and bring it to the next level. There will a cocktail party the night before the concert, on Thursday August 28 starting at 9 p.m. at the Beach Bar right next to the S.O.A.P. Monument on the boardwalk by Convention Hall. This will be a meet & greet event, where the Creators also intend to announce names that will be added to the S.O.A.P. Monument that were overlooked the first time around. The Creators and friends will take the stage at the Stone Pony on the 29th in a very relaxed situation, all sitting on stools across the stage. They'll start by swapping stories about those early days of the Asbury music scene, from 1960 to 1970, and fielding questions from the audience about certain players or events of those days. These are stories that you might have read about in the many books published on the history of Jersey Shore Rock 'n' Roll, and some that were never told before. But this time you'll hear the real versions from the people who were there and lived them, and the audience will be able to ask questions concerning the events. This will be the real history of the '60s on the Jersey Shore. During that time some of the Creators will do songs off-the-cuff from those early days on the Shore, whether with just a guitar or piano as backup or a whole band of Creaters joining in to jam -- very raw and very real versions of those favorite songs from the back in the early days on the Shore that laid the foundation for what would be known worldwide as The Sound of Asbury Park. Please note: only the performers listed publicly and in the promotions to perform at this event will be there on August 29. There will be no surprise guests! Remember that tentative fall leg that was in the works a couple weeks ago? It's no longer in the works. Several sources have confirmed that the plan has now been scrapped. We're looking at a good chance for more dates to be added in August, but right now it appears the August 30 show in Milwaukee stands as the final performance of the Magic tour. If you're heading to the Millennium Stadium concert on Saturday, as the stadium leg resumes, newswales.co.uk has some travel tips. Here's a good read as we gear up for the Magic tour to resume on Saturday night. In an interview with bassplayer.com., Garry Tallent takes a quick look further on up the road: "The tour with Bruce goes through the summer. We have another album's worth of material recorded, but no word yet on a release or future tours." Garry also talks about working with Brendan O'Brien, working with Vini vs. Max, his favorite Bruce tracks, technique, gear, and more. Read the full interview here. Responsible for many of the Magic tour photos from the you've seen here on Backstreets.com as well as Springsteen's official site, Backstreets photographer A. M. Saddler has launched his own new website. You'll find many more of his Springsteen images there for your viewing pleasure: Saddler has shot 15 shows on the Magic tour so far, from rehearsal in Jersey to April in Florida, as well as the 2006 Light of Day and 2007 Carengie Hall tribute. There are also galleries of Phil Lesh, Josh Ritter, Ryan Adams, Jesse Malin, Maybe Pete, and more. Visit the galleries at www.amsaddler.com, and watch for his work in issues of Backstreets magazine to come. Ellas "Bo Diddley" Bates died today of heart failure at 79. It would be hard to overestimate the rock 'n' roll pioneer and Hall of Famer's impact on the form in general; as for his influence on Springsteen, we surely wouldn't have "She's the One" without him. To say nothing of "Not Fade Away," "Mona," "Preacher's Daughter".... Read the Associated Press obituary here. Long, full life though it was, we're saddened to hear of the death of legendary photographer David Gahr, 85, on Sunday at 85. Renowned for his documenation of folk musicians in the '60s, Gahr shot the classic photos gracing the cover of The Wild, The Innocent, & the E Street Shuffle -- the close-up of Bruce on the front, the E Street Band on the back. Read Mark Satlof's reminscence -- Gahr was "irascible to the end" -- on the Shore Fire blog. D30: HAPPY BIRTHDAY, DARKNESS TOUR! Today marks the 30th anniversary of the beginning of the Darkness on the Edge of Town tour -- Bruce and the band hit the road before the album was released -- which opened on May 23, 1978 in Buffalo, NY. To mark the occasion, Buffalo's 97 Rock has posted Dale Anderson's original review of that Shea Theatre Show from the Buffalo Evening News: "...three hours and three encores later, it was clear that this powerhouse had everything it needed to go 80 dates in 70 cities. And then some." European show-goers, fill us in! : Don't forget, we count on readers to give us their perspectives with show reports, particularly as Bruce and the band head farther afield. If you're catching any of the upcoming European concerts, we'd strongly encourage you to send us a report -- your thoughts on the night, highlights, setlist if you can -- as soon as possible after the show, to help us with our coverage. If you'd like to fill us in, please email to: onstage@backstreets.com. It's much appreciated. G.A. policy: We've gotten a lot of questions about the G.A. procedure for Europe, and specifically whether the U.S. rules would carry over. We can't say for certain, but our understanding is that the U.S. entrance policy will not be in effect. With festival seating being more common in Europe, venues there tend to have systems already in place -- no need to override them or fix what ain't broke. If that changes, we'll have word here. Home fires: Remember how we reported that Patti Scialfa would "definitely" be in Europe? As of now it's looking like... maybe not so definite. Just another reminder of how little in this thing of ours is set in stone. Magical mystery tour: Speaking of not set in stone, a rumored itinerary for fall U.S. dates has been floating around in recent days. Sources tell us that there's truth to it -- we're likely looking at a two-month arena leg in September and October, leading off with Bruce and the band's August 30 Milwaukee show. But as always, we wait for official confirmation; you'll know when it's posted here that a fall schedule is no longer tentative. View the current official itinerary here. C'mon, Steve! : For the three Giants Stadium shows -- which are confirmed, marking Bruce and the E Street Band's return to the States in July -- a special package is on the auction block at charityfolks.com. Up for bids are two VIP tickets to your choice of the three shows, along with the chance to meet Little Steven. Proceeds benefit Share Our Strength, working to fight childhood hunger and currently providing disaster relief to victims of the Myanmar cyclone. Update: Photo by Mark R. Sullivan. Click here to see Mark's gallery from the show. Mark Wright is a singer/songwriter who was one of the few artists from the UK to feature on the Light of Day tribute compilation, with his version of "Two Hearts." He has rooted himself in American music and has toured with folk legend and friend of Woody Guthrie, Ramblin' Jack Elliott, as well as recording at the birthplace of rock and roll, Sun Studio in Memphis, Tennessee. Now signed to indie label Revolver Records, Mark's second release for the label is Real World: The Bruce Springsteen Project, a new album of ten Springsteen covers, now available from the Backstreet Records shop. This is the title track. DARKNESS AT 30: "A MAP OF THE FUTURE"
Perhaps no Springsteen album lends itself to retrospection more than Darkness on the Edge of Town, which celebrates its 30th anniversary on June 2. Released to mixed and sometimes confused reviews, the ten tales of regret and failure are now regarded as both masterful and prophetic, told with a new sense of maturity and vision. 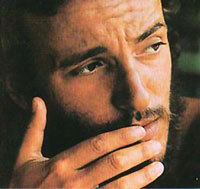 In "Map of the Future: Darkness on the Edge of Town at 30," two-time Pulitizer Prize finalist Joyce Millman writes that the "affirmations of democratic ideals" Springsteen embraced on Darkness are as "relevant today as commentaries on the darkness of cynicism and the dragons of endless war" as they were 30 years ago. Read Millman's reassessment, written for the Bruce Springsteen Special Collection. If you're in South Florida, don't miss a catch to see the Big Man in person this weekend -- Clarence Clemons will be making an appearance on Saturday afternoon to sign copies of his new Temple of Soul CD, Brothers in Arms, and to play a few tracks from it, too. While the Magic tour is about to ramp up from arenas to stadiums, Bruce has been spending this break doing some serious downsizing -- last week it was the Count Basie Theatre, and last night it was all the way down to the Stone Pony. Bruce was back on the Pony stage for another school benefit on Tuesday night, once again backed by Bobby Bandiera's band (with horns), and joined by Southside Johnny and Patti Scialfa. By now we're familiar with the basics of the annual set -- classic covers like "634-5789," "Seven Nights to Rock," and "Twist and Shout" intermingling with houserockin' rave-ups from Bruce's own catalog -- this year clocking in at two hours and 20 minutes. "Hold On, I'm Coming" was a particular stand-out, with Bruce and Bobby doing their best Sam & Dave. Patti had a great turn on "It Takes Two," with Bobby shining on the guitar solo, and her vocal on "All I Have to Do is Dream" was another highlight. As for originals, "Girls in Their Summer Clothes" was added to the mix, and this private benefit for parents and teachers continues to bring out some otherwise oft-overlooked tracks. There was "Cover Me," "Rendezvous," "The Fever," "From Small Things," "Pink Cadillac," and an all-too-rare dip into the '92 songbook for "Man's Job." "Thunder Road" may not be a rarity, but try it played solo-electric in the intimate confines of the Pony -- ah, if only we all could -- as a small crowd sings along. Soundchecked but not played: "Sugar, Sugar," "Ain't Too Proud to Beg." Catching up with "the girls"
Tonight, Lisa Lowell headlines the Stone Pony in Asbury Park, NJ, with her band Beautiful Behavior, including fellow Sessions Band players Jeremy Chatzky on bass and Larry Eagle on drums. [Photo above from a gig earlier this year, by John Cavanaugh.] They'll be performing her original material tonight, "all stuff I've written in the last four years," she told the Asbury Park Press. Look for them to go on at 10 p.m., but there's a great undercard too, including Sonny Kenn and Maybe Pete opening. Visit her site at www.lisalowell.com. Patti Scialfa rejoined the E Street Band in Red Bank on Wednesday for only her second show with them this year. Previously, she played the April 22 Magic show in Tampa, bringing the band back to full force the day after Danny's funeral, but otherwise has been "soaking up the last hurrah of having all three of the kids in the house at once," she tells Backstreets. "Our oldest is off to college next year, so I wanted to be here and just go through the whole college process with him. I'll do the European tour, and some of the shows at the end of the tour. I miss being there! But I have to say, I'm really enjoying my kids... it's harder to leave as they get older, in a funny kind of way." But Europe is a go? "Oh, definitely -- I'm already booked in. I will be there." In the meantime, Patti's "honorary First Lady of New Jersey" work with Habitat for Humanity ramps up on Monday, May 12. She'll lead a Wall Raising ceremony for Paterson Habitat's "Women Build" project that afternoon, along with her mom Vivian and her daughter Jessica. That's preceded by a fund-raising luncheon hosted by Greenbaum Interiors. For tickets and more information, visit patersonhabitat.org. 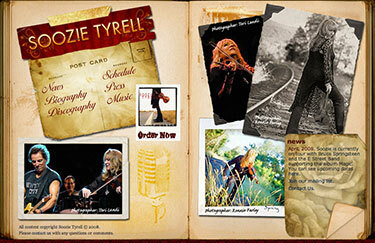 And check out Sister Soozie Tyrell's website, which has just gotten a major redesign and looks great. Of course with so much of her energy going into the Magic tour right now, the schedule listed there matches Bruce's exactly... but this is where you'll find her future gig listings, along with, at present, a full discography, great photos, streaming tracks from her 2003 solo album White Lines, and more, at soozietyrell.com. Ah, the stuff that dreams are made of... or at least the stuff that fan rap sessions are made of: "They should do the Darkness album start to finish!" Well, they just did, at the 1,500-seat Count Basie Theatre in Red Bank, NJ. And it wasn't just a Darkness 30th anniversary celebration -- Bruce and the E Street band tackled the full Born to Run album in order, too, for what he described at the outset as "something we've never done before and you're not gonna see anywhere else." 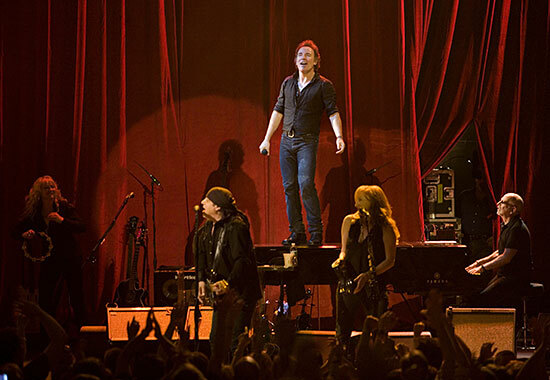 An E Street Band theater show -- finding them packed tighter than ever on a small stage like this, with Nils, Patti, and Soozie all added to the line-up since the theater days -- would have been exceptional enough, but the four Perfect Album Sides of the setlist put this one over the top. The evening began with the Basie's Rusty Young describing the benefit show's mission, to raise money for the restoration of this 80-year-old theater to its original glory -- "when the ceiling wasn't covered in netting" -- and this night alone brought in more than three million dollars. Young noted that Patti Scialfa is the "honorary co-chair of our capital campaign," and after he asked her for ideas... "tonight is her answer." Generous donations also made it possible, Young said, for 37 wounded veterans to attend the show, talking the bus in from Walter Reed. Patti came out next to a mighty standing ovation -- "I'm supposed to welcome you, and you're welcoming me!" 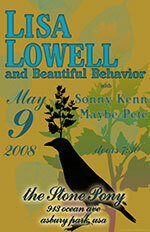 -- speaking of her and the rest of the band's history at the Basie, and of the importance of saving venues like this one. She was followed by NBC anchor Brian Williams, who goes back a long way as a fan and was clearly psyched just to be talking through Springsteen's mic ("the first and last time that will ever happen"). He recalled hitting the Stone Pony and the Tradewinds back in the day, ever on Bruce-watch; he also touched on the recent loss of Danny Federici, saying that "Great families endure. And great, great bands endure." "The netting is just to keep the larger pieces of debris from falling down," he added, "and if there's an entity that could cause the big ones to fall, it's this group here.... Ladies and gentlemen, Bruce Springsteen and the E Street Band!" And with that, it was Darkness, side one, to start the show. "We're gonna start with Darkness, so we don't send you home suicidal!" Bruce quickly aborted "Badlands" seconds in, after a rough start: "We fucked it up already! I knew there was a reason why we didn't do this," he laughed. "Maybe we shouldn't do it!" But they did it. And man, they did it. From track to track, for the first time live, it was Darkness sequenced as Bruce originally intended it to be heard, full of intensity from the howls on "Something in the Night" to the seemingly never-ending coda of "Racing in the Street," a straight-ahead "Factory" (not the Bruce/Patti duet of recent years) with Steve on mandolin, the modern twist on "Prove It All Night" as Nils rocked the new solo, and at the end of "side two," a hugely powerful vocal on the title track. Loads of guitar from Springsteen, too -- every solo except that Nils spectacular, in fact. Bruce offered a solo to Steve at one point, which was respectfully declined. After an only-fitting intermission, Born to Run got the same sequential treatment, offering a distinct reminder of what a freakin' masterpiece it is, as well as of the difference in tone between the two records. After the ferocity of the first set, here Bruce was having a blast, jumping into the crowd on the "Freeze-out" and even being held up by the crowd -- did we mention this was a theater show? Several clambers up on the piano throughout this second set, too. "Tenth" also brought a full horn section to the stage -- "The Mighty Max Horns," as Bruce later called them -- consisting of Mark Pender on trumpet, LaBamba on trombone, Jerry Vivino and Ed Manion on saxes. Pender came back out for "Meeting Across the River," giving his own spin to Randy Brecker's original trumpet part for a few minutes of absolute magic, also thanks to the beautfiul accompaniment from Roy and Garry. "Jungleland" had Steve stepping up for a soaring solo, and of course Clarence -- invigorated, up and around for much of this night -- did his thing and did it well. And that wasn't the end -- as the needle hit the runout groove, Bruce said, "Let's bring out the horns! We've got a few more for you!" And they used the horn section to maximum effect for the entire encore, four bonus tracks starting off with BTR/Darkness outtake "So Young and in Love." "Kitty's Back" was next -- "and she's got somebody with her!" Bruce teased at the end, "Kitty's back, and she's got somebody with her!" That somebody was "Rosalita," and finally, Eddie Floyd's "Raise Your Hand" made sure we got an R&B cover in there for the full effect of this '70s theater revival. It was a particular bygone era brought back to life, a celebration of the band's history and just one of its heydays, and a tip of the hat to a couple of 30th anniversaries... yet as ever with Springsteen, it was most notably moving forward and trying something new at the same time. And playing for a take-'em-all-in-with-one-glance crowd from the orchestra to the balcony, a packed theater practically on top of Bruce and the band (at least compared to where they have been and will be playing in this new millenium), it was the perfect crucible for revisiting the passion and the power of these classic records. An experiment, no doubt -- and an electrifying success. ALBERT EINSTEIN AND BRUCE SPRINGSTEEN! Last night at the New Jersey Performing Arts Center, Bruce Springsteen was part of the inauguaral class inducted into the New Jersey Hall of Fame -- and he was there for the honor, also giving the speech to induct Frank Sinatra and joining LaBamba and the Hubcaps for "Glory Days." It was a nice birthday present for Bruce's mom Adele, too, who was in the crowd with Patti. Read a report in the Star-Ledger, and we'll let YouTube tell the story (with thanks to John Zur). Watch: Bruce being announced, Bruce's induction speech, Bruce inducts Frank Sinatra, Bruce jams with the Hubcaps before "Glory Days." The inaugural induction ceremony for the New Jersey Hall of Fame is Sunday, May 4, honoring Springsteen along with numerous other Garden State greats like Frank Sinatra, Toni Morrison, and Vince Lombardi. The event is at the New Jersey Performing Arts Center, with La Bamba and the Hubcaps serving as the house band. For more information, visit www.njhalloffame.com. Amid all the March Magic madness, we somehow missed the debut release from the latest version of Clarence Clemons’s group Temple of Soul, titled Brothers in Arms. The album, out now, features ten tracks -- including a cover of Hendrix’s “Purple Haze” -- blending contemporary R&B, danceable funk, and neo-soul. Along with C on sax and vocals, the band is very much a Who's Who: producer/drummer/songwriter extraordinaire Narada Michael Walden, a longtime Clarence collaborator, sings and drums; T.M. Stevens, former Pretender and Disciple of Soul (he appeared on Little Steven's Freedom No Compromise album), sings and plays bass; and in-demand session man Vernon "Ice" Black (Santana, Herbie Hancock) handles guitar and vocal duties. A fun, summer party album, and a definite change of pace from E Street. The album is in stock now in the Backstreet Records shop; check out a preview below. In addition to the Big Man blowing his horn on "Anna," don't miss him taking a verse at the 2:25 mark. In other shop news: the 2007 fan-favorite book For You is back in stock now. Limited quantities have been printed -- so it’s not gonna be around forever -- and if you haven't seen it, For You is a fun collection of first-person sermons on Springsteen and the effect he and his music have had on listeners around the world. Along with the fan stories, it's packed with color and black and white photos, too, many of which are not available elsewhere. As Uncut reports, 17 Springsteen albums will be reissued on CD in the UK later this month, from Greetings to The Rising, to coincide with the E Street Band's visit. We've determined that these will be the same as the 2005 deluxe reissues from Japan (with the exception of the Japanese-specific packaging content, obi strips, etc.). In other words, no new sound improvements here, just the swell "miniaturized LP sleeve" treatment previously available. More details on the new UK series once we have them in hand; in the meantime, see our online shop for more on the 2005 Japanese reissues, most still in stock. We hope you'll check out The Danny Federici Melanoma Fund website, if you haven't already; the fund, which Danny worked to set up before he died, is "dedicated to the research and development of new and effective treatments for melanoma through funding for additional clinical trials based upon Danny's melanoma treatments and other methods headed by Dr. Paul Chapman. Our other objective is to raise awareness for this aggressive disease." Explore the site, and you'll find a message from Danny, a story about his last performance in Indianapolis from his son Jason, and more. But if you'd like to donate to the cause in Danny's honor, we recommend you do so with a check, by mail, rather than through the website. By doing so, you can specify exactly where you want your donation to go, to make sure it's properly allocated to the melanoma program. We suggest making the check out to The Danny Federici Melanoma Fund, with a letter specifying that the donation is for the exclusive purpose of this Fund; and further including language like: "I request that no portion of this donation be used for Memorial Sloan Kettering overhead or administrative expenses." After wrapping up this spring North American leg of the Magic tour tomorrow in Ft. Lauderdale, Springsteen will be playing a smaller show closer to home less than a week later. 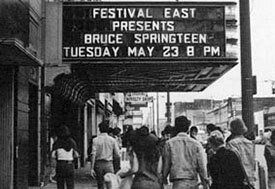 Wednesday night's Count Basie Theatre benefit was originally billed as "An Evening with Bruce Springsteen." Now, we're anticipating "An Evening with Bruce Springsteen and the E Street Band," as Bruce plans to bring the whole crew to Red Bank for their first full theater show (the Basie holds roughly 1,500) since 1980. ONE STEP CLOSER TO "PERSON OF THE YEAR"
In the latest issue of Time magazine, due out tomorrow, Bruce Springsteen is named one of "The Time 100," their list of the 100 most influential people in the world. None other than Sean Penn writes: “Sense of self, and the way one shares it, is perhaps the most valuable and poetic gift in the arsenal of one's life and craft. In contemporary American music, Springsteen, 58, is its most enduring and robust giver...." Read Penn's full piece here. Also on newsstands, the May 1 edition of Rolling Stone is the magazine's "Best of Rock 2008" issue, naming Bruce Springsteen and the E Street Band the year's Best Live Band. Check it here, with an appreciation by David Fricke. You may have already seen this video on YouTube, but here it is with improved and remixed audio: Alejandro Escovedo performing his new single with Bruce and the E Street Band in Houston, 4/14/08. Alejandro's new album, Real Animal, is set for release on June 24. Normally we'd just make this a link in "Out on the Wire," but there's just too much good stuff in this Charlottesville prep piece, the cover story from this week's edition of The Hook. Scroll down through the Boss Glossary, and you'll find a nice piece on Robbin Thompson (who got a tip of the hat from the stage last night) on his Steel Mill days with Springsteen, and a few more more local Boss retrospectives. The working class hero gets fed up: watch "Do Your Job" at funnyordie.com. Our favorite Daily Show guest (oh, and NBC News anchor) Brian Williams blogs the Basie show on The Daily Nightly: "It was heaven."